Manufacturing businesses, with their many connections, represent one of the greatest opportunities for those who can help them. 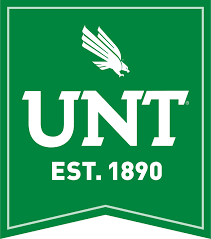 Manufacturing executives will be coming from across the nation to the Dallas area for the 2019 Smart Manufacturing Summit. 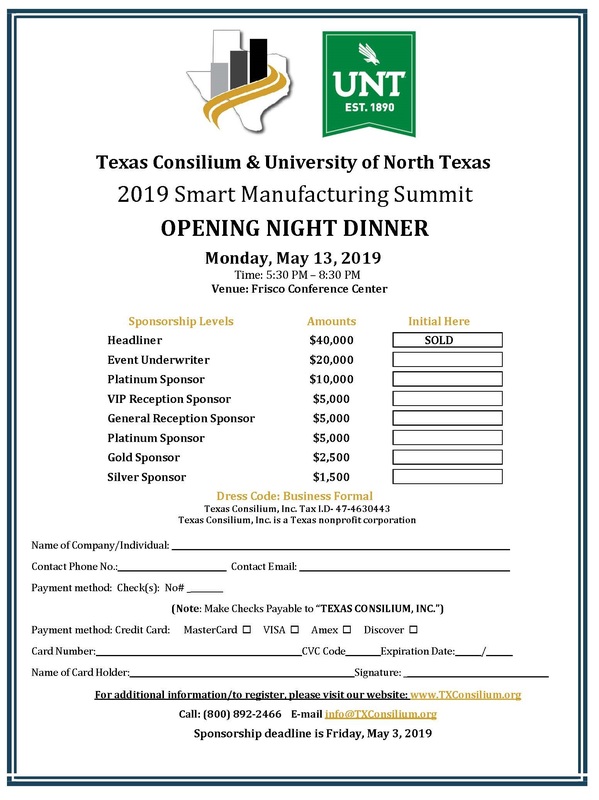 Texas Consilium and University of North Texas expect to add hundreds more Texas manufacturing CEOs, speakers, panelists and other key business leaders for our Opening Night Dinner, Monday, May 13, 2019. If you support manufacturers in Texas or nationwide, this will be a leadership gathering for you! Chief Executive Group is the publisher of Chief Executive magazine, a national bi-monthly publication that reaches 91% of the CEOs who run companies with more than $50 million per year and represent 70.2% of the private economy in the U.S. We expect that our event attendance will draw from throughout this group, with an added focus on Texas business leaders and the manufacturing industry. Check out the great benefits available and choose the level most appropriate for you. This is not just an event — it’s the start of some long-term relationships. Would you like to host visiting CEOs or other top leaders at your sponsored tables? Let us know and we can work with you to connect you with the leaders you want to reach. This will be a great opportunity to connect with your customers, clients, members and prospects. BONUS: With any sponsorship, you and each of your registered sponsorship guests will also receive a complimentary 12-month subscription to D CEO magazine, courtesy of our media partner D CEO. A $54 value per guest, free. Questions? Please contact Marcos Pustilnik, Sponsorship Team Leader, 800-892-2466 x7104 or by email. 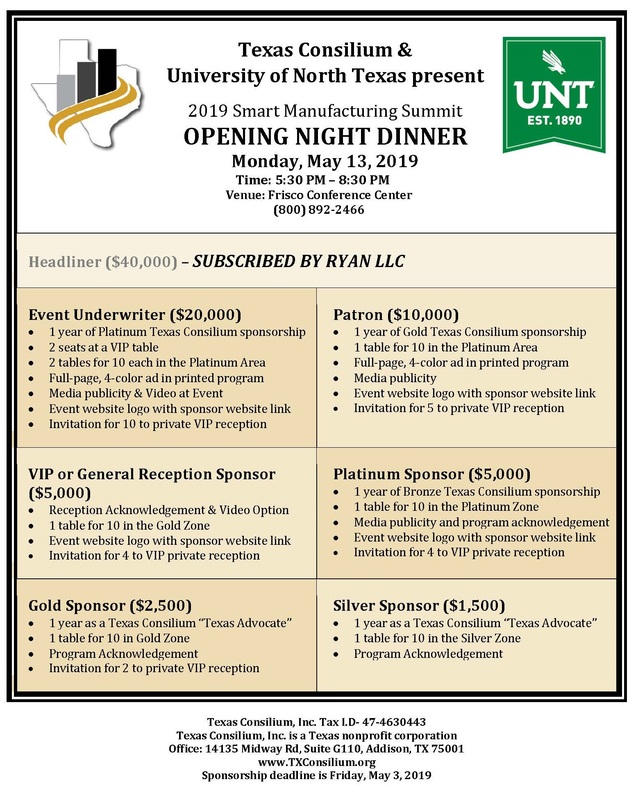 For more about the 2019 Smart Manufacturing Summit & Opening Night Dinner, click HERE. To submit your sponsorship subscription online and pay by credit card, please click HERE. Ryan’s value proposition is far greater than the industry-leading tax recovery services that they are internationally recognized for. They’re also focused on your overall tax performance—providing innovative solutions to the underlying causes of the errors they identify—and creating greater opportunities to measure and improve your efficiency, develop a more strategic approach to tax, and deliver outstanding value to improve the tax savings for your business.